It looks like major art dealer Sotheby’s “just got Banksy-ed” in a brilliant art prank by the renowned anonymous street artist. At its sale on Friday evening, one of Banksy’s iconic Girl with Balloon paintings self-destructed moments after being auctioned off for £1,042,000 (US$1.4 million). The canvas passed through a shredder concealed within its frame, mere seconds after the hammer went down. 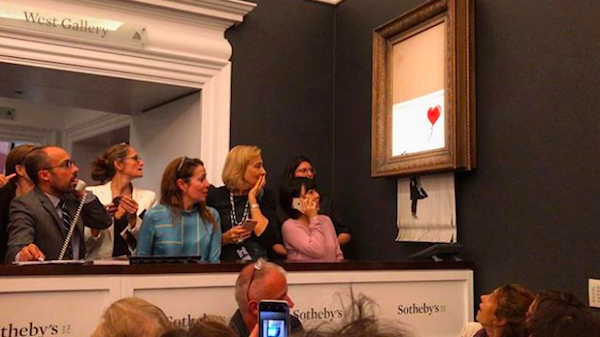 Sotheby’s senior director Alex Branczik told The Art Newspaper, “It appears we’ve just got Banksy’ed.” He added that “the greatest British street artist” had given everyone “a little piece of Banksy genius” that night. Branczik maintains that he was not in on the ruse, though it is unclear whether any other members of the staff were. Apparently a man dressed in black with sunglasses and a hat was seen wrestling with security guards at the entrance not long after the incident. This has led some to suspect that Banksy himself was at the venue, where he remotely initiated the painting’s shredding.